Another product expected to be very popular this year is Stretchkins! The life size cuddly toys are great for children to play/dance/cuddle with. They have bands on the hands and feet to attach to your child's hands and feet so they can stretch with them! They encourage active play making it lots of fun to move around. 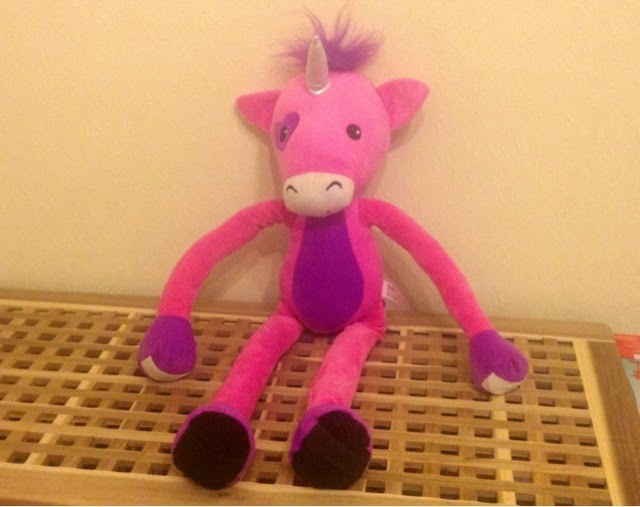 They are suitable for children ages 3 and over and there are four different characters available; Unicorn, Frog, Puppy and Elephant. 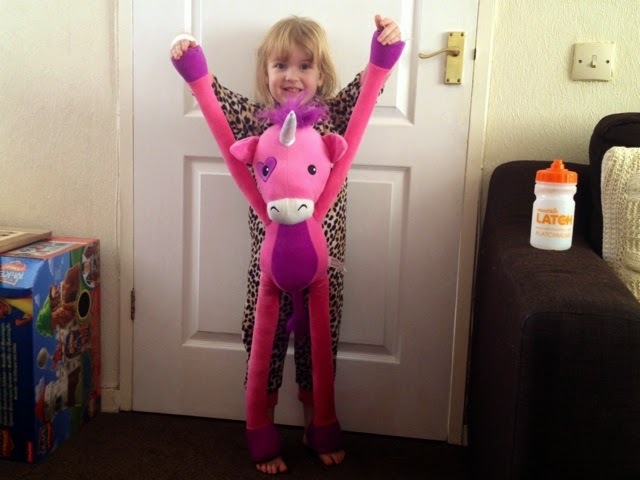 Gracie was sent the Unicorn Stretchkin to try out. The toy itself is great quality, lovely and cuddly with big fluffy hair. Gracie wanted to play with it straight away so we unpacked it and played with it almost immediately. She had so much fun boucing around with her Stretchkin strapped to her hands and feet. It is certainly perfect for burning energy and having fun when the weather is too miserable to play outside! Gracie is almost 4 and the unicorn is almost the same size as her. I would definitely say she would get a good few years use out of it. It also makes a great cuddly pal for bedtime! The Stretchkins range is available from all good toy retailers and are priced between £16.99-£20 so definitely shop around for the best deal. They would make a perfect christmas gift! I have one Unicorn Stretchkin to give away to one lucky reader all you need to do for a chance to win is enter the rafflecopter form below. My daughter would love the Unicorn! She's seen it on TV and wants it for Christmas. Unicorn my daughter would love it because it is pink! The elephant - what a great sensory toy too! I love the puppy, so cute.